Ursanne Loche is a Breton commoner living in Bravil. Her husband Aleron has fallen in with a very bad crowd and gotten himself into serious trouble, and she asks for your help to get him out of it. She wears a pair of belted braies, a belted vest and a pair of sack cloth sandals. 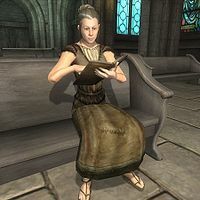 She carries a loaf of bread, a copy of Gods and Worship as well as the key to her home.